Aaron Gaumer Sr. was born on Oct. 7, 1821 in Alburtis, Lehigh County, PA, the son of Heinrich "Henry" and Susanna (Mory) Gaumer. He appears to have spent his entire life farming in the Alburtis/Macungie area. He was united in matrimony with Amanda Schmoyer (Oct. 1, 1829-1911), daughter of Daniel and Maria (Paule) Schmoyer. The couple produced these known children -- Henry Wilkison Gaumer, Cecilia Gaumer, Catharine S. "Cassie" Schmoyer, Daniel Nathan Gaumer, Victor M. Gaumer, Lewis Oscar Gaumer, Ellen Jane Shankweiler Seifert, Jonas O. Gaumer and Minnie A. Meyer. After the death of Aaron's father in the 1850s, the widowed mother came to live in their home, and was there circa 1860-1870. Suffering from heart valve disease, gastritis and nephritis, Aaron died on Dec. 3, 1908, at the age of 87, in South Bethlehem, Northampton County. Interment was in the Lehigh Church Cemetery, with W.M. Weiesbach of South Bethlehem signing the death certificate. Amanda outlived her spouse by three years and went to live with her youngest daughter Minnie Meyer at at 516 South Bishopthorpe Street in Bethlehem. She fell and fractured her hip and femur in late 1910, and lived for another five months, until the Grim Reaper swept her away on April 13, 1911. Son Henry Wilkison Gaumer (1850- ? ) was born in about 1850. Daughter Cecilia Gaumer (1851- ? ) was born in about 1851. Daughter Catharine S. "Cassie" Gaumer (1854-1936) was born on Aug. 23, 1854. At the age of about 18, in 1872, she married 18-year-old Alvin M. Schmoyer (Dec. 23, 1854-1941), the son of Benjamin and Mary (Desch) Schmoyer of Lower Macungie. They produced an astonishing 13 children -- Howard Schmoyer, Joseph Schmoyer, Minnie Nuss, Lloyd Schmoyer, Gertrude "Gertie" Bartholomew, Mary Bittenbender, Harvey Schmoyer, Elsie Huber, twins George B. Schmoyer and Walter S. Schmoyer, Charles M. Schmoyer, Katie Orner Schaeffer and Maud Moyer. When the couple was first married, they made a home with Cassie's parents in Lower Macungie. Within a few years, they relocated to Ohio and engaged in farming in the community of Pitchin, Clark County and in Seneca County. The family returned to Lehigh County by the late 1880s. The Schmoyers were members of the Evangelical Lutheran Church of the Redeemer, and Alvin belonged to the Clinton Chamber of the Knights of Pythias. Over time, they farmed in various locations over the years, including in the community of East Texas in 1900 and at the corner of 17th and Green Street in Allentown. They retired in about 1921 and dwelled at 742 North 17th Street in Allentown. Sadly, Cassie suffered a heart attack and died at the age of 82 on Dec. 12, 1936. Interment was in Lehigh Church Cemetery, with Rev. Gomer Spieker Rees preaching the funeral service. Alvin outlived his bride by five years and relocated into the home of grandson George Nuss 2145 Main Boulevard in Allentown. He was felled by a cerebral hemorrhage and died 10 days later, at the age of 86, on Nov. 22, 1941. In an obituary in the Allentown Morning Call, he was pictured, and the news story said he left 104 descendants, including 56 granchildren and 39 great-grandchildren. Funeral services were led by Rev. A.W. Lindenmuth, with burial in Lehigh Church Cemetery. Son Howard Schmoyer (1878- ? ) was born in about 1878. Nothing more about him is known. Son Joseph A. Schmoyer (1880-1940) was born in Jan. 1880 in Lower Macungie. As a young man, he learned the trade of stone mason. Later, he lived for many years in Wanamakers, PA, where he operated the Washington House hotel. Joseph was married twice. At the age of 22, in about 1902, he wedded his first bride, Fianna Abbyssinia Miller ( ? - ? ) of Snydersville. Heartache shook their world in the late spring of 1908 when son Howard, age 14 months, was run over by a trolley while playing between the tracks of the Lehigh Valley Transit Company. The boy was fatally injured, dying on June 17, 1908. His second spouse, who were joined in marriage on June 20, 1914, was Bertha "Bertie" Miller ( ? - ? ) of Coopersburg. Rev. Milton Reinhard officiated at the bride's home, with news of the wedding printed in the Allentown Leader. The couple then moved into his residence at 823 Greenleaf Street. In all, he had 10 offspring, among them Howard B. Schmoyer, William Schmoyer, Ammon Schmoyer, Allen Schmoyer, Luther Schmoyer, Mrs. Harvey Leinbach, Mrs. Scott Ritzman, Mrs. James Greenwalt, Pauline Schmoyer and Jean Schmoyer. Joseph made news in 1930 when, during the era of Prohibition, he was arrested after federal agents found "a small quantity of whiskey at the hotel," reported the Allentown Morning Call. He was found guilty of sale and possession and had his hotel license suspended for three months, with two years' probation. He returned to the mason work in about 1933. He was a member of the Jordan Reformed Church, the Republican Club of Wanamakers and the Pioneer Fire Company. He passed away in Allentown Hospital at the age of 60 on May 8, 1940. Burial was in the Jordan Reformed Cemetery, and the Morning Call published an obituary. Daughter Minnie Schmoyer (1881-1980) was born in Aug. 1881 in Pitchin, Clark County, OH. As a young woman of 18, she earned income as a weaver at a local silk mill. She married Erwin F. Nuss ( ? - ? ) and made a residence in Allentown. They produced three known children, George W. Nuss Sr., Helen M. Nuss and Pauline C. Fallstich. Son George was taken into the household of his grandparents and raised to adulthood. The Nusses were longtime members of the First Mennonite Church of Allentown. The widowed Minnie made her final home at 1111 Turner Street in Allentown. She died at home at the age of 98 on June 29, 1980. An obituary in the Allentown Morning Call said that she was the oldest member of her church congregation. Son Lloyd A. Schmoyer (1883-1971) was born in March 1883 in Seneca County, OH. He was united in marriage with Laura Walck ( ? -1962). The couple produced 11 children -- Elwood Schmoyer, Marvin Schmoyer, Fred Schmoyer, Alvin Schmoyer, James Schmoyer, Lloyd Schmoyer, Ethel Tretter, Mabel Musselman, Arlene Breiner, Myrtle Winters and Marian Snyder. They lived in Allentown, and Lloyd was employed for many years as a supervisor with D.G. Dery Silk Mill in Catasauqua. He was a steward for the American Legion post in Allentown. Sadly, Laura passed into eternity in 1962. Lloyd outlived his wife by nine years and lived at 717 South Fifth Street. Toward the end, he became a resident of the Belle Haven Nursing Home in Quakertown. He passed into eternity on June 9, 1971. The Allentown Morning Call reported in an obituary that his survivors included 22 grandchildren and 21 great-grandchildren. Daughter Gertrude V. "Gertie" Schmoyer (1884-1910) was born on Aug. 8, 1884. In 1903, at the age of 18 or 19, she was united in holy wedlock with Phillip D. Bartholomew (Nov. 15, 1879-1953), a resident of Emmaus and the son of Frank A. and Sarah (Newhard) Bartholomew of Beersville. The couple made a home on West Union Street in Fullerton, Whitehall Township, Lehigh County. During their relatively brief married lives together, they produced three children -- Estella M. "Stella" Call, Anna C. "Annie" Thorsen and Spurgeon A.S. Bartholomew. Tragically, during or following pregnancy, she was stricken with high blood pressure and developed eclampsia, which may have led to convulsions and/or a coma. Then after suffering a stroke, she succumbed at the age of 26 on Sept. 26, 1910. Following funeral services held in the family home, her remains were lowered into repose in Hillside Cemetery in Fullerton. An obituary in the Allentown Leader said that she "had been sick for some time" and left behind her husband and the three youngsters. Within 15 months, on New Year's Day 1912, he married again, to Alice L. Sherry ( ? -1958) of Fullerton, daughter of Elwood and Alice (Glace) Sherry of Mauch Chunk/Jim Thorpe, Carbon County. The nuptials were led by Rev. Thomas H. Krick, pastor of St. John's Reformed Church. The couple lived in Fullerton and eventually moved to 945 Green Street in Allentown. They had more children of their own -- Raymond Bartholomew, Kenneth Bartholomew, Roselyn J. Strobl and Doris L. Brown. Over the span of 24 years, Phillip was employed as a machinist with Mack Manufacturing Company, retiring in 1950. Stricken with pancreatic cancer, he passed away in Allentown on the next to last day of 1953. Interment was in Hillside Cemetery. Alice outlived her husband by a little more than four years and endured the death of stepdaughter Anna Thorsen in Burlington, VT. Alice was swept away by the Grim Reaper at the age of 72 on Feb. 12, 1958. Circa 1958, son Spurgeon lived in the Bronx, NY and daughter Stella in Allentown. Daughter Mary A. Schmoyer (1885-1965) was born in Nov. 1885 in Seneca County, OH and relocated as a girl back to her parents' home region. Unmarried at the age of 24, she lived at home and worked as a "danterer" (overseer) in a local silk mill. She wedded Walter J. Bittenbender ( ? - ? ) and established a home in Allentown. Their only child was Pearl C. Brinker. The Bittenbenders' address was 2521 Pennsylvania Street, and they belonged to St. Peter's Lutheran Church on Allentown's Hanover Avenue. Mary was admitted to Sacred Heart Hospital in Allentown, where she succumbed on St. Patrick's Day 1965. An obituary appeared in the Allentown Morning Call. Son Harvey M. Schmoyer (1887-1949) was born in Aug. 1887 in Tiffin, Seneca County, OH. He grew up working on the home farm and then in 1920 as a laborer with a motor car company, likely Mack Manufacturing Corporation. He is known to have been a machinist for Mack for 29 years. He was joined in wedlock with Estella (Stephens) Erney. She brought a son to the union, Norman S. Erney. The couple then produced a son of their own, Ray A. Schmoyer. In 1949, they dwelled at 742 North 17th Street in Allentown. They were members of the Church of the Redeemer and the 19th Street Bible Class. He also belonged to the Fraternal Order of Tigers, Knights of the Golden Eagle, Keystone Fire Company and the United Automobile Workers local union of the Congress of Industrial Organizations (CIO). Harvey suffered several strokes in 1949 and, after the second attack, was admitted to Allentown Hospital, where he expired on Sept. 12, 1949. The Allentown Morning Call published an obituary. Daughter Elsie M. Schmoyer (1889-1977) was born in Aug. 1889 in Alburtis. At the age of 20, in about 1909, she was joined in matrimony with George O. Huber (1888- ? ). The Hubers did not reproduce. George earned income as a weaver in a silk mill, and Elsie belonged to St. Peter's Lutheran Church of Hanover Avenue in Allentown. Having been married for two decades, the couple made a home with Elsie's parents in 1930. A the age of 88, Elsie made her residence at 1408 East Gordon Street in Allentown. She died in Allentown Hospital on Oct. 11, 1977. An obituary appeared in the Allentown Morning Call. Son George B. Schmoyer (1891-1951) was born in July 1891 in Chapman, PA or in Upper Macungie Township, a twin with his brother Walter. He was employed as a helper in a silk mill in 1910, at the age of 18. He also farmed and later was hired by Wenz Company. George married Alverta S.L. Fink ( ? -1960). They were the parents of Leonard Schmoyer, Lillian Williamson, May Gillette, Eva Michak and two daughters who died young. The Schmoyers were Lutherans, and their address in the early 1950s was 133 Woodlawn Street. Sadly, George died at home at the age of 60 on Dec. 16, 1951. In an obituary, the Allentown Morning Call reported that "In ill health since 1945, he was confined to his home for four years." Alverta lived for another nearly nine years and died on Sept. 16, 1960. Son Walter S. Schmoyer (1891-1980) was born in July 1891 in Chapman, PA or in Upper Macungie Township, a twin with his brother George. He labored as a helper in a produce house in 1910. Walter married Ida A.L. Lewis (1903- ? ). They were the parents of Walter F. Schmoyer, Gerald D. Schmoyer, Christine L. Reitz, Anna A. Laudenslager, Roberta L. Oldt, Gladys A. Sedlock, Marie L. Haydt, Josephine I. Spedding and Gertrude Laponuke. They made a home in the early 1940s in Allentown, where Walter worked for the contractor Harry Fenstermacher as a cement finisher, retiring in 1957. The Schmoyers were members of the Salem United Methodist Church of Allentown. As a widower, Walter dwelled at 511 North 14th Street in Allentown. With his health failing, he was admitted to Gnaden Huetten Hospital in Lehighton, Carbon County. He succumbed at the age of 88 on June 20, 1980. An obituary in the Allentown Morning Call noted that his survivors included 23 grandchildren and 23 great-grandchildren. Son Charles M. Schmoyer (1893-1967) was born in 1893 in Western Salisbury Township. He married Sarah L. Fink ( ? - ? ). The couple bore these offspring -- Russell E. Schmoyer, Alvin H. Schmoyer, Kenneth C. Schmoyer, Vernon M. Schmoyer, Merritt C. Schmoyer, Floyd C. Schmoyer and Arlene V. Moyer. They lived in Wescosville, where he was a barber for 20 years in partnership with their son Floyd. They were members of the Lutheran congregation of Western Salisbury Church. Charles retired in 1958 and the son took over operations. At the age of 73, Charles died on June 5, 1967 in Mosser Nursing Home in Trexlertown. An obituary in the Allentown Morning Call counted among his survivors 25 grandchildren and 22 great-grandchildren. Daughter Katie E. Schmoyer (1895-1989) was born in April 1895 in Minesite, Lehigh County. She was twice married. She first was united in wedlock with Stanley T. Orner ( ? - ? ). The couple resided in Bath, PA, and Katie was a member of Grace Lutheran Church of Bethlehem. They were the parents of Orlo J. Orner, Carl A. Orner, Ervin E. Orner, Marjorie Sinclair and Florence Horning. Later, by 1930, she married Lewis E. Schaeffer ( ? - ? ). For 21 years, Katie and Lewis owned and operated Schaeffer's Homemade Candies in Bath, retiring in 1957. In 1980, she lived in Bethlehem. Her final home was in Gracedale near Nazareth. She died on Sept. 12, 1989 at the age of 94. An obituary was printed in the Allentown Morning Call. Daughter Maud C. Schmoyer (1896-1936) was born on Nov. 3, 1896. She was joined in matrimoy with Albert Moyer ( ? - ? ). The couple resided in Allentown at the address of 211 Eighth Street. At the age of about 38, she contracted an infection which inflamed her fallopian tubes. She suffered for 26 months and underwent surgery at the state hospital in Allentown. Sadly, she succumbed just 11 days after her 40th birthday on Nov. 14, 1936. An autopsy was conducted, and her physician was careful to note on the death certificate that her illness had not been caused by gonorrhea. Burial was in Lehigh Cemetery following funeral services conducted by Rev. Gomer Reese. An obituary in the Allentown Morning Call said that floral tributes were provided by her husband, neighbors, Mrs. Moyer of Sunbury and Mr. and Mrs. Charles Snyder and daughter Bernice, and that Maud's brother Harvey provided the slumber robe. Son Daniel Nathan Gaumer (1857- ? ) was born in about 1857. Nothing more about him is known. Son Victor M. Gaumer (1861-1952) was born on Jan. 25, 1861 in Macungie. As an adult, he dwelled in Pottstown, Montgomery County, working as a wheelright for the wagon repair and dealer A.W. Faust. The widowed Victor spent his final years at the address of 623 Chestnut Street in Pottstown. At the age of 91, he was stricken with a heart attack and died on March 9, 1952. Edith Krause of Pottstown signed his official Pennsylvania certificate of death. Interment was in Edgewood Cemetery in Pottstown. Son Lewis Oscar Gaumer (1863-1943) was born on Dec. 29, 1863 in Alburtis. He learned the trade of blacksmithing and operated in Macungie for a number of years. Lewis married Emma Schaeffer (June 2, 1870-1914), daughter of James F. and Anna Maria (Trexler) Schaeffer. The couple produced these known children -- Claude S. Gaumer, Stanley S. Gaumer, Howard S. Gaumer, Edgar S. Gaumer, Paul S. Gaumer, Lester S. Gaumer, Gladys K. Huffort, Miriam Michener, Anna M. Gaumer and one other who died young. When the federal census was taken in 1900, the family resided in Macungie, with Lewis working at a local brass factory. In about 1901, they relocated to Allentown, where Lewis was employed by an automobile factory in 1910-1920. They lived at 1414 Gordon Street in Allentown in 1914. Grief enveloped the family when Emma, afflicted with chronic kidney disease, was admitted to Allentown Hospital. Before surgery could be held, she succumbed at the age of 44 on Nov. 12, 1914. An obituary was printed in the Allentown Morning Call, which said she also was survived by her parents. Her remains were lowered into eternal rest in Greenwood Cemetery. Lewis outlived his wife by almost 30 years. For two decades, he was employed as a tool dresser for Mack Manufacturing Company. He retired in 1927 and spent 16 years in retirement. His address in 1936 was Kutztown, and then in the early 1940s he made a home with married daughter Gladys at 324½ North Jefferson Street in Allentown. To celebrate his 79th birthday in 1942, a family dinner was held at Schwepp's Restaurant at Tilghman and Eighth Streets. Only his sons Howard (in California) and Stanley (in Ohio) were unable to attend, said the Morning Call. He was felled by a cerebral hemorrhage and died a week later, at the age of 79, on Sept. 25, 1943. Burial was in Greenwood Cemetery, with Liston S. Gaumer providing details for the official Pennsylvania certificate of death. Burial was in Greenwood Cemetery, with an obituary printed in the Morning Call. He was survived by 15 grandchildren. Son Claude S. Gaumer (1890-1953) was born on July 19, 1890 in Macungie. He married Mabel Everett ( ? -1966), a native of Cementon and the daughter of James Franklin and Ellen L. (Peters) Everett. The couple bore an only son, Francis E. Gaumer. Mabel's father once was described by the Allentown Morning Call as "one of the pioneers in the manufacture of Portland Cement in this vicinity and the oldest employe of the Atlas Cement Co.... [While] superintendent of the Keystone mills the first cement that was ever made successfully in rotary kilns was turned out there." Claude and Mabel lived in Easton for many years, with an address of 686 Lehigh Street in the early 1950s. Claude earned a living as chief clerk for Lehigh Portland Cement. They were members of Christ Lutheran Church of Allentown. At the age of 62, burdened with fluid buildup in the lungs, Claude was admitted to Easton Hospital, where he passed away on May 6, 1953. Interment was in Grandview Cemetery in Allentown. As a widow, Mabel made a home with her son at 404 Greenwood Avenue in Easton. She died in Easton Hospital at the age of 74 on Feb. 10, 1966. Her obituary was published in the Morning Call. Grandson Francis E. Gaumer (1914-1966) was born on May 6, 1914 in Allentown. He was a graduate of Muhlenberg College. During World War II, he served with the U.S. Marine Corps. He was united in wedlock with Elizabeth L. Weisel ( ? - ? ). daughter of Robert and Elsie Weisel. Their only son was Bruce C. Gaumer. Francis was employed as an accountant, initially for 25 years by the family business, Lehigh Portland Cement Company. Then in about 1965, he joined Washington Wood Products of Washington, NJ. Reported the Allentown Morning Call, "He was one of the original membes of the Suburban Rescue Squad, Easton." They belonged to St. Andrew's Lutheran Church of Easton. Circa the mid-1960s, the Gaumers lived in an apartment building at 360 Taylor in Easton. Francis' widowed mother resided in their apartment until her passing in February 1966. Francis only lived for another six months after his mother's death. Suffering from lung cancer, he became a patient in Easton Hospital and died there on Aug. 4, 1966. Burial was in Grandview Cemetery, with an obituary appearing in the Morning Call. Son Bruce served in the U.S. Armed Forces during the Vietnam War. Son Stanley S. Gaumer (1891-1964) was born in Dec. 1891 in Macungie. As an 18-year-old in Allentown, in 1910, he worked as a bundler in a silk mill. He also worked in Allentown as a dispatcher for Railway Express. He was twice married. On April 15, 1911, at the age of 19, he was united in wedlock with his first bride, 19-year-old Lizzie J. Sauerwine (1891- ? ), daughter of Wilson P. and Jennie (Dorward) Sauerwine. News of the engagement was made public in the Allentown Morning Call. The couple were the parents of a son, Eugene Gaumer. Later in the first year of marriage, Stanley contracted a serious case of typhoid fever but recovered. After eight years of marriage, the couple divorced on Nov. 22, 1919. Stanley relocated to Cleveland, OH, where he worked as an expressman and lived at 1984 East 69th Street. At the age of 28, on Feb. 18, 1920, Stanley and Isabel Mae (Kitson) Burns ( ? - ? ) were joined in marriage in Cleveland, with Rev. Joel B. Hayden officiating. An immigrant from England, she was the daughter of Joseph and Isabella (Morrison) Kitson, and also was divorced from a first spouse. They bore a son of their own, Stanley "Lewis" Gaumer. In about 1924, they relocated to Ashtabula, OH, and remained for the balance of their lives. Their home in 1964 was at 5700 Shepherd Road, Ashtabula. Stanley died on March 29, 1964 in an Ashtabula hospital. The Morning Call printed an obituary. Grandson Eugene Gaumer (1912- ? ) was born in about 1912. Nothing more is known. Grandson Stanley "Lewis" Gaumer (1928- ? ) was born in about 1928 in Saybrook, Ashtabula County, OH. He labored as a machinist in young adulthood. On Nov. 30, 1952, at the age of 24, he married 21-year-old Inez A. Fassett (Oct. 31, 1931- ? ), daughter of Floyd L. and Ella (Pitts) Fassett of Ashtabula. She worked as a bookkeeper and clerk at the time of marriage. They made a home in Ashtabula in 1964 at the death of his father. Son Howard S. Gaumer (1892-1967) was born on Dec. 19, 1892 in Macungie. At the age of 17, in 1910, he earned income as an eyelet worker for a shoe factory in Allentown. By 1918, he relocated to Southern California, where he resided in San Gabriel, Los Angeles County and found employment with the Broadway Department Store. During World War I, he resigned from Broadway to join the American Expeditionary Force, and held the rank of sergeant. After returning from military duty, on July 24, 1918, Howard was united in marriage with Hazel F. Baker (Nov. 15, 1897-1992), daughter of Charles H. and Flora (Dickenson) Baker. The Tulare (CA) Advance Register once said that Hazel's father was "a widely known blind Tulare violin maker." Their children were Glenn Gaumer and Nadine Gaumer. Just four months after the war's armistice, in February 1919, Howard's was among 103 Broadway employees whose names were commemorated in a bronze memorial placed in the store. Circa 1930, when the U.S. Census was taken, the family lived in San Gabriel, with Howard working as a carpenter. The family went into shock in December 1938 when Hazel's father suffered a heart attack and died while playing in an orchestra performance for the Townsend Club. Their address in later years was 5438 North Charlotte Avenue. At the age of 72, Howard was swept away by the Grim Reaper in San Gabriel on Nov. 9, 1967. He rests for all time in Live Oak Memorial park in Monrovia. A short obituary appeared in the Allentown Morning Call. Hazel outlived her spouse by a quarter of a century. She passed away on Oct. 26, 1992 at the age of 94. Granddaughter Nadine Gaumer (1920- ? ) was born in 1920 in San Gabriel, Los Angeles County. On Dec. 30, 1940, at the age of 20, she was joined in matrimonial union with Ray A. Phillips ( ? - ? ). She lived in California in 1967. Grandson Glenn Howard Gaumer (1921-1997) was born on Oct. 6, 1921. He spent his life in California. At the age of 34, he was employed as an engineer by Associated Oil Company at its refinery in Avon and lived at 1846 Spruce Street in Berkeley. He was considered an expert boatman and belonged to the Sierra Club. Glenn avoided near-death in May 1956 while rafting with three others on the "swift, swollen Merced River," said the Oakland Tribune. One of his companions, John Chromy, a "San Francisco engineer who 'ran' rivers as a hobby, was drowned ... when his kayak capsized and he was carried 11 miles." Glenn's kayak also capsized, and while he tried a rescue by throwing a rope to the victim, the current was too strong, and Glenn was forced to give up and go ashore. The trio of survivors then "followed [Chromy's] bobbing form in a car on the highway paralleling the river. He was carried beneath the Briceburg bridge and into the steep canyon, finally lodging on a rock. Gaumer managed to swim out and hold him on the rock." It took three hours for an Army helicopter to rescue Glenn and recover Chromy's body. The tragedy did not dampen Glenn's enthusiasm for rafting rapids, and in August of that same year he was pictured in the Tribune with Frank Cockerline after shooting the rapids of Feather River. In 1963, he is believed to have married Hildegard Sander ( ? - ? ), with their marriage license reported in the San Francisco Examiner. In later years, Glenn resided in Contra Costa County. His employer, Associated Oil, was acquired by J. Paul Getty and in 1966, the Avon refinery was purchased by Phillips Petroleum. In October 1971, he was pictured in the Tribune posed with squash growing at the large oxidation pond at the Avon refinery. He died on Dec. 14, 1997. Son Edgar S. Gaumer (1896-1939) was born on Feb. 3, 1896 in Macungie. At the age of five, he moved with his parents to Allentown. He was united in matrimony with Bessie K. LaRoche ( ? - ? ), daughter of Louis and Ella (Scheet) LaRoche of South St. Cloud Street. They lived at 1744 Linden Street in Allentown and were the parents of Anna Gaumer, Pauline Louise Gaumer, Lewis LaRoche Gaumer and Thomas Gaumer. Edgar worked as an assistant foreman for Paper Box Company in Allentown, a company partly owned by his father in law. The family were members of the Asbury Methodist Episcopal Church, and Edgar was a Boy Scout scoutmaster of a troop affiliated with the church. He also belonged to the Keystone Fire Company. Edgar was stricken with pulmonary tuberculosis in 1934 and never fully recovered. The illness forced him to quit work in October 1938. His health continued to spiral downward, and he died on Valentine's Day, just 11 days after his 43rd birthday. An obituary in the Allentown Morning Call noted that his remains were interred in Fairview Cemetery. Bessie lived as a widow at 1914 Hamilton Street and 1830 Hamilton Street. By 1981, she had relocated to Seminole, FL. Granddaughter Anna Gaumer ( ? - ? ) studied at West Chester State Teachers College. She married John Jackson and to have dwelled in Allentown in 1948. By 1956, the Jacksons had relocated to Indian Rock Beach, FL. They resided in Seminole, FL circa 1981, with Anna's mother living under their roof. Granddaughter Pauline Louise Gaumer ( ? - ? ) was a student at West Chester State Teachers College and elected as a junior councilor of the school for the 1939-1940 school term. The following year, she served as secretary of the Women's Dormitory Division of the college's student council. Upon graduation, she was hired as a gymnasium teacher in the Allentown Public Schools' Jefferson Building. In 1943, during World War II, she wedded Frederick "Fred" Strain ( ? - ? ), son of Robert J. Strain of Allentown. The nuptials were held in St. Joseph, MO, at First Methodist Episcopal Church, with Rev. Oliver M. Keve presiding. At the time of their engagement, reported in the Allentown Morning Call, Fred was a bomber pilot who had just been commissioned in Columbus, MS. He received the Distinguished Flying Cross, Air Medal with four clusters, German Ocucpation with Berlin Airlift Clasp and many other commendations. After the war, the family made their home in Allentown, where Fred secured employment with Pennsylvania Power and Light Company. They became the parents of Carol Louise Strain and Ellen Lou Strain. When the Korean War broke out, Fred rejoined the military, serving as a first lieutenant with the 1257th Air Transport Squadron. Upon his arrival back home, Fred opened Strain's Texaco Service Station at 1241 North Seventh Street. The family relocated to Texas and were there in 1956. By 1981, they were in Palm Bay, FL. Grandson Lewis LaRoche Gaumer (1920-1981) was born on Oct. 6, 1920 in Allentown. As an upcoming senior in Allentown High School in the summer of 1937, he attended a month-long citizens military camp at Camp Meade, MD. He wedded Betty Buchanan ( ? - ? ). They produced two sons, James Gaumer and William Lewis Gaumer. As with his father and maternal grandfather, Lewis was employed by Allentown Paper Box Company, joining the company at about the age of 18. His tenure there lasted for 42 years, and he eventually became a partner in the business. In 1969, he was elected to the advisory board of the National Paper Box Association's central division, serving some 400 manufacturers and suppliers of rigid paper boxes. They dwelled for decades on Berger Street in Emmaus. They were members of Asbury United Methodist church of Allentown, and he served in 1973 as president of the Emmaus Kiwanis Club. Sadly, at the age of 60, Lewis passed away on March 10, 1981 in Allentown Hospital. He was pictured in an obituary in the Allentown Morning Call. Son William married Peggy Lee Strausser in June 1977. Grandson Thomas E. Gaumer (1928-1998) was born in about 1928. As a young man, he served in the U.S. Coast Guard. On Feb. 10, 1951, Thomas married Nettie L. Wallace ( ? - ? ), daughter of D. Randall and Mary (Wysocki) Wallace. Their children were David R. Gaumer, Gail Ritter and Peter T. Gaumer. The Gaumers lived at 166 Berger Street in Emmaus in 1956 and by 1981 were in Palmer Township near Allentown. They belonged to St. John's United Church of Christ in Emmaus. For more than three decades, Thomas earned a living as a dispatcher for F.A. Rohrbach of Allentown, a concrete construction contractor. He retired in 1998. Sadly, Thomas passed away at home at the age of 70 on Oct. 24, 1998. He was pictured in an obituary in the Allentown Morning Call. Son Paul S. Gaumer (1898-1962) was born in June 1898. As a teenager, he left home and joined the U.S. Army, serving "with Gen. John J. Pershing in the Pancho Villa campaign," said the Arizona Republic. Then after the eruption of World War I, "he was on the first troop ship from America to land in France." He returned home after the war. Unmarried at the age of 21, in 1920, he labored as a stonecutter for a monument company in Allentown. On March 23, 1921, at the age of 22, he married Erny R. Pickartz ( ? - ? ), a n ative of New York City and the daughter of German immigrants Henry C. and Adele (Ellerbrook) Pickarta. Their only known daughter was Adele E.F. Strong. He dwelled in New Smithville, Lehigh County in 1939, Greenwich Township, Berks County in 1940 and and in Allentown in 1943, where he was superintendent of the Wenz Company Monument Works. Circa 1940, Paul's widowed father lived in their home. At some point, they may have moved to Frenchtown, NJ, where Paul was commander of the local American Legion post. He also was a life member of the Lions Club International and the Greenleaf Lodge in Allentown. The family made a major decision in 1948 t relocate to Arizona, settling in the town of Chandler, southeast of Phoenix. After four years of residence there, Paul was elected to the Chandler town council in 1952, serving until 1954, at which time the town became re-classified as a city. He then was elected Chandler's first mayor, holding that post from 1954 to 1956. During their years in Chandler, the family belonged to the Holy Trinity Lutheran Church. Remaining active in the community, Paul chaired the Maricopa County District Hospital board of directors, helping to form the hospital district and construct the Chandler Community Hospital circa 1961. He also belonged to the Chandler-Willliams Air Force Base coordinating council. Paul died in a Veterans Administration hospital in Long Beach, CA on Jan. 12, 1962. Funeral services were led by Rev. Kenneth Peterson, with military rites provided by the Matthew B. Juan Post of the Legion, with burial in East Rest Haven Cemetery. He was pictured and profiled in an obituary in the Republic. Granddaughter Adele E.F. Gaumer (1922- ? ) was born in about 1922. After graduation from high school in Allentown, she graduated from Albright College in Reading and then the University of Cincinnati College of Nursing and Health, where she was awarded a bachelor of science degree. She then took post-graduate studies at Columbia University in New York City. During the 1940s, she taught at the nursing schools at Presbyterian Hospital in Philadelphia, Flushing (NY) Hospital and Iowa Methodist Hospital, Des Moines. She was a member of the Order of Eastern Star, the Iowa State Nurses Association, the American Nurses Association and the National League of Nursing Education. On Aug. 12, 1949, at the age of about 27, she married Wayland Thornton Strong ( ? - ? ), son of Harold C. Strong of Tempe, AZ. Rev. Herbrecht officiated at the wedding, held at the First Congregational Church of Phoenix. News of the marriage and her bridal photograph were printed in the Allentown Morning Call. Wayland was a graduate of the University of Arizona and an Army veteran of World War II. At one point, he was concertmaster of the Arizona State college orchestra in Tempe. The Strongs made a home in Westchester, CA in 1952 and in Denver, CO in 1962. Son Lester S. Gaumer (1900- ? ) was born in Jan. 1900 in Macungie. He made a home in 1943 in Allentown. Daughter Gladys K. Gaumer (1902- ? ) was born in about 1902. As a young woman, she joined Trinity Reformed Church and was active with its choir. On June 25, 1921, she wedded fellow choir member Russell Huffort ( ? - ? ), son of James "Oliver" Huffort of 932 Chew Street. News of their engagement was printed in the Allentown Morning Call. The wedding was held at the home of Gladys' parents, officiated by Rev. J.J. Schaeffer. At the time, he was employed by Citizens Trust Company as a clerk. The couple had one daughter -- Mrs. Darwin J. Helwig. Circa 1943, their residence was at 324½ North Jefferson Street in Allentown. Later, he joined Bethlehem Steel Corporation and worked there circa 1946. They remained members of the Trinity church over the years. To celebrate their silver wedding anniversary in June 1946, the couple along with Gladys' brother Claude and wife took a driving trip to Ashtabula, OH to visit her brother Stanley. Their travel plans made news in the gossip columns of the Morning Call. Granddaughter (?) Huffort ( ? - ? ) wedded Darwin J. Helwig. They resided in Catawissa, PA in 1946. Daughter Miriam Gaumer (1904- ? ) was born in about 1904. She married J. Maurice Michener ( ? - ? ). They lived in 1939 in Flemington, NJ and in 1943 in Allentown and in 1964 in Wescosville.. Daughter Anna M. Gaumer (1906- ? ) was born in about 1906. Daughter Ellen Jane "Ella" Gaumer (1864-1952) was born on July 11, 1864 in Alburtis/Macungie. In about 1884, when she was 20 years of age, he was joined in marital union with her first husband, 17-year-old James C. Shankweiler (April 6, 1867-1918), son of William and Sally Ann Shankweiler. They produced six children -- Lloyd Shankweiler, Earl Shankweiler, Herbert Shankweiler, Minnie Laudenslager and Gertrude Sherry and one who died young. Circa 1900, James earned a living as a railroad brakeman in Allentown. The Allentown Leader issue of Aug. 28, 1914 said that Ellen "and her family and friends went to Central Park yesterday and had a very pleasant time. Various games were played after which an elegant supper was served. During the evening they enjoyed the various concessions at the park, after which they spent the remainder of the evening at the theatre." The couple separated between 1910 and 1915. Failing to pay support, he was jailed in 1915 by Alderman Jones, and later was ordered by the county court to pay her $1.50 for desertion and non-support. Later in life, he was was considered homeless and a "transient." In August 1917, he and John Hartzell, Emmanuel Morgan and Victor F. Miller were arrested on a charge of vagrancy but were released after promising to leave the property. At the age of 51, stricken with a combination of influenza, bronchial pneumonia and acute heart disease, James died in Allentown Hospital on Dec. 16, 1918. Burial was in Fairview Cemetery. An obituary in the Allentown Morning Call named his surviving siblings as Wilson Shankweiler, Jacob Shankweiler, Frank Shankweiler, Robert Shankweiler, Charles Shankweiler and Mrs. Wilson Miller. Ella remained widowed for seven years and lived at 65 East Broad Street in Bethlehem. In August 1925, she obtained a marriage license to wed railroad engineer Edwin H. Seifert (May 16, 1867-1951) of 334 West Street, also in Bethlehem. The news was printed in the Morning Call. Edwin was the son of David and Elizabeth (Haffler) Seifert and a native of Springfield Township, Bucks County He also had been married previously -- to Aravesta Steinbach ( ? -1918) -- and brought eight of his own children to the second union -- Norman D. Seifert, Stanley Floyd Seifert, Thurston E. Seifert, Herbert Seifert, Nevin C. Seifert, Mrs. Wilbur Johnson, Florence Schwartz and Bessie Weaver. A farmer for most of his life, Edwin later operated a gasoline service station at Newburg, PA. Their home in 1936 was in Nazareth, PA and in 1941-1951 in Leithsville near Hellertown, Northampton County. They belonged to St. Matthew's Lutheran Church of Bethlehem. The Sept. 20, 1950 edition of the Morning Call contained a five-generation photo of Ellen with her son Earl, granddaughter Leona Poe, great-granddaughter Jean Moffett and holding great-great granddaughter Jill Moffett. Sadly, as his health failed due to heart problems, Edwin was admitted to St. Luke's Hospital. He died there after two days on Oct. 29, 1951. Burial was in Lower Saucon Cemetery. Ella's final year as a widow were spent living at 643 North 11th Street in Allentown. As her health declined from heart disease and senile dementia, she was admitted to the Lehigh County Home in South Whitehall Township. She succumbed there at age 87 on Aug. 3, 1952. Her remains were placed into rest in Grandview Cemetery in Allentown. An obituary in the Morning Call noted that her survivors included 11 grandchildren, 17 great-grandchildren and two great-great grandchildren. Son Lloyd F. Shankweiler (1884- ? ) was born in Oct. 1884. At the age of 16, in 1900, he worked as a silk mill laborer in Allentown. He was joined in marriage on Aug. 9, 1908 with Gertrude M. Diehl ( ? - ? ), daughter of Isadore S. and Tevillia (Kressley) Diehl of Pleasant Corner, Heldelberg Township. 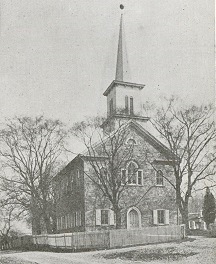 The nuptials were held at St. Andrew Reformed Church, led by Rev. R.M. Kern, and were highlighted in the Allentown Morning Call. Prior to marriage, Gertrude worked at a cigar factory later acquired by General Mills. The couple were the parents of Reynold Shankweiler, Kermit Shankweiler and Arlene Van Buskirk. They made a residence in Allentown, where Lloyd was employed for 43 years by the Allentown branch of meat-packing firm Swift and Company and later was promoted to superintendent. Gertrude was a member of St. Andrew's church, at Ninth and Gordon Streets, and was active with its Women's Missionary Society, while Lloyd belonged to the St. Michael's Lutheran Church. On their silver wedding anniversary in 1933, they held a dinner in their home at 915 North Sixth Street. Among the guests in attendance, said the Morning Call, were Mr. and Mrs. I.S. Diehl, Mrs. Seifert, Mr. and Mrs. Reynold L. Shankweiler and son Donald, Mr. and Mrs. Kermit D. Shankweiler and son Larry and Mr. and Mrs. Randolph Van Buskirk. Sadly, Gertrude died at the age of 47, in Allentown Hospital, on April 7, 1934. The Morning Call said that she had suffered "an illness of the past four months, the last nine weeks of which she was bedfast." Rev. Aulenbach officiated at the funeral service, with burial in Hillside Cemetery. Lloyd outlived his wife by 14 years and married again to Ida J. Harwick ( ? - ? ). He was a member of the Junior Order of United American Mechanics and the North End, South Side and 5th Ward Republican Clubs. He retired in about 1947 and spent his final years at 528 West Euclid Avenue. Grandson Reynold L. Shankweiler was married and had a son Donald. Grandson Kermit D. Shankweiler was married and had a son Larry. Granddaughter Arlene Shankweiler was twice married. Her first spouse was Randolph Van Buskirk (circa 1933). By 1958, she had wedded Arthur Davis and relocated to Vallejo, CA. Son Earl A. Shankweiler (1887- ? ) was born in Oct. 1887. In 1900, at the age of 12, he worked with his brother Lloyd as laborers in an Allentown silk mill. He dwelled at 709 Lawrence Street in Allentown in 1918 and at 905 South 10th Street in Allentown in 1950. He married Elizabeth I. "Lizzie" Koenig ( ? -1959), daughter of Charles and Anne (Moyer) Koenig. They produced three known children, Leona May Poe, Carrol B. Shankweiler and Arida Wieder. Sadness swept over the family in mid-February 1910 when son Carrol died of pneumonia and was buried in Fairview Cemetery. Earl made a living as a furniture worker. Over the years, Lizzie belonged to the Evangelical Lutheran Church, and their address circa 1959 was 905 South 10th Street in Allentown. Lizzie was cut away by the Grim Reaper at the age of 71 on Aug. 29, 1959. Earl only lived for about a year-and-a-half after Lizzie's death. He passed away at home on March 15, 1961, with an obituary printed in the Allentown Morning Call. Granddaughter Leona May Shankweiler married Edgar Poe and lived in Lehighton in 1959. Granddaughter Arida Shankweiler wedded Marcus A. Wieder and dwelled in Allentown. Son Herbert W. Shankweiler (1890-1977) was born in Jan. 1890. As a young man, he lived at 732 Florence Street. In about 1909, he was united in holy matrimony with Margaret Steiger ( ? -1964), daughter of Frank and Jane (Ibach) Steiger. News of their April 1909 marriage license was printed in the Allentown Morning Call. The two children born to this couple were Dorothy Web and Herbert R. Shankweiler. Circa 1916, he was in a business partnership with Cleveland Snyder, known as "Shankweiler & Snyder." At some point, by 1937, they relocated to Syracuse, NY where he was employed by Carrier Corporation. During World War II, he served in the U.S. Coast and Geodetic Survey Office in Washington, DC. He rejoined Carrier after the war and retired in 1953. They remained in Syracuse during their retirement years and in about 1959 moved into their married daughter's home at 613 Schuyler Street. Sadly, Margaret passed into eternity at the age of 76 on Dec. 2, 1964. In his final years, Herbert went to live in his daughter's Florida home in New Port Richey. He died at the age of 89 in Tampa General Hospital on Feb. 6, 1977, and his remains were brought back to Allentown for burial. An obituary appeared in his hometown newspaper, the Morning Call. Granddaughter Dorothy Shankweiler ( ? - ? ) married Albert ("Elbert"?) Webb. They dwelled in New Port Richey, FL in 1977. Grandson Herbert R. "Bud" Shankweiler ( ? - ? ) was born in (?). On Oct. 24, 1937, in nuptials held in the bride's residence, he wedded Thelma I. (Sandy) Knauss ( ? - ? ), daughter of Lillian E. Sandy of 1944 Tilghman Street in Allentown. Rev. Paul R. Wert, of the Ebenezer Evangelical Church, officiated. At the time of marriage, reported the Allentown Morning Call, he worked for Searle and Bachman Company, Inc., and she with J.E.T. Pharaceutical Company. Circa 1964, they were in Washington, DC and in 1977, they made a home in Holiday, FL. Daughter Minnie A. Shankweiler (1895-1985) was born in Nov. 1895 in Allentown. She wedded Augustus "Gustave" (or "Gus") Laudenslager ( ? - ? ). Their two sons were Carlton G. Laudenslager and Gustave E. Laudenslager. The couple lived in Allentown and were members of St. Andrew's United Church of Christ. In the political community, Minnie served as president of the North End Republican Club Auxiliary. At the age of 91, Minnie succumbed as a resident of Cedarbrook in Allentown on Nov. 27, 1985. An obituary in the Allentown Morning Call said she was survived by seven grandchildren, 18 great-grandchildren and 11 great-great grandchildren. Grandson Carlton G. Laudenslager lived in Allentown in 1985. Grandson Gustave E. Laudenslager resided in Hellertown in 1985. Daughter Gertrude Shankweiler ( ? -1979) was born in about 1905. She married Kenneth F. Sherry ( ? - ? ). They bore one son, Richard S. Sherry, and their home for many years was in Bethlehem. They belonged to Grace Lutheran Church. In retirement, the couple dwelled in Monocacy Towers on Main Street. On Aug. 25, 1979, Gertrude died in their home at the age of 74. An obituary was published in the Allentown Morning Call. Grandson Richard S. Sherry is believed to have been married with three children. They lived in Bethlehem in 1985. Son Jonas O. Gaumer (1872-1945) was born on Aug. (or April) 24, 1872 in Macungie. He never married but appears to have relished the bachelor life. In November 1906, he boarded at the Continental Hotel, but unhappy with the noise at night, rented two rooms in the Singmaster Building agove the J.H. Stephen meat market. He was a member of the Friendly Lodge of the International Order of Odd Fellows of Macungie. In the spring of 1914, Jonas and his friend John Heffner left to travel in the West, first stopping in Pittsburgh, and thence to Tiffin, OH, before continuing westward. Over the years, he worked in several shoe factories in the Allentown/Pen Argyl region, including Century Shoe Company. While operating equipment in the Pen Argyl factory in 1915, his right thumb was caught in the machinery and a portion of it was severed. Circa 1910-1941, he and his friend Edward "Peb" Moll spent their Sundays camping in Sigmund and in Mountain Creek Park in Hosensack, and Jonas eventually was named caretaker for the bungalow in the park. The pair enjoyed hunting and in the summer of 1927 killed a 13-lb. groundhog, generating news in the gossip columns of the Allentown Morning Call. He lived in the 1940s in the Lehigh County Home. After he fell in his room and broke his left femur, he was admitted to Sacred Heart Hospital in Allentown and died there at the age of 74 on April 26, 1945. An obituary in the Morning Call said that interment was in the mausoleum of Memorial Park Cemetery. Rev. Dr. Corson C. Snyder, of St. Peter's Lutheran Church, preached the funeral sermon. Daughter Minnie Amanda Gaumer (1873-1949) was born on Feb. 19, 1873 in Berks County. She married William Frederick Meyer (April 21, 1873-1942), son of Charles and Lydia (Haines) Meyer of Macungie. Rev. Myron O. Rath officiated. The couple produced three children -- Lillian Irene "Lillie" Mabry, William C. Meyer and Paul A. Meyer. As a young man, William was active in Macungie sports, with a special focus on playing baseball. He was employed for 42 years as a telegrapher for the Lehigh Valley Railroad. He retired in about 1936. They initially lived in Easton until 1903, when they relocated to Bethlehem, where for years they made a home at 516 South Bishopthorpe Street. Minnie was a member of the Ladies Aid Society and Quilters' Society at St. Peter's Lutheran Church as well as its senior Bible class, while William belonged to the Men's Brotherhood, Bethlehem Aerie, the Fraternal Order of Eagles and the Macungie Beneficial Association. Sadly, William suffered a heart attack in early 1942. He lingered for five months but succumbed at home at the age of 69 on May 17, 1942. Burial was in the Memorial Park in Bethlehem. He was survived by five grandchildren, reported the Allentown Morning Call. Minnie survived as a widow for seven years. She became stricken with colon cancer and endured the illness for 18 months before she passed away at home on Aug. 24, 1949 at the age of 76. Daughter Lillian Irene "Lillie" Meyer ( ? -1997) was born in Easton. She married Shelley A. Mabry ( ? - ? ). The couple bore one daughter, Patricia Hearn. Their home was in Bethlehem in 1942, and they were Presbyterians. For 15 years, Lillie was employed as a secretary for Stanley Home Products' Pennsylvania regional director. She spent her final years at Beverly Hills Rehabilitation Center in Hot Springs, AR, where she died at the age of 97 on Sept. 28, 1997. An obituary was printed in the Allentown Morning Call. Granddaughter Patricia Mabry ( ? - ? ) was born in (?). She was united in wedlock with Rev. Raymond E. Hearn ( ? - ? ). They were the parents of three children. Circa 1997, they dwelled in Hot Springs, AR. Son William C. Meyer ( ? - ? ) moved to New Jersey and lived in Westfield in 1949. Son Paul A. Meyer ( ? - ? ) was born in (?). In about 1927, he was joined in marriage with Alice Wilhelmina Wright (Sept. 25, 1907-1940), a native of Paterson, NJ, the daughter of William and Wilhelmina (Tiets) Wright, now living at Fountain Hill. News of their engagement was printed in the Allentown Morning Call. They were the parents of three -- Pauline Meyer, Richard Meyer and Alice Meyer. In mid-April 1937, the children presented a program at St. Peter's Lutheran Church, among other children and grandchildren of church members. Circa 1939, Paul served as Scoutmaster with the Boy Scouts troop of the Pro-Catholic Church of the Nativity in Bethelem, but resigned to take a similar role with the Cub Scouts pack of St. Peter's Lutheran Church. Alice was active with the church's Young Women's Missionary Society, Senior Bible Class and the emergency choir. She also belonged to the Ladt Beth Rebekah Lodge of the Odd Fellows. Heartbreak swept over the family on Dec. 14, 1940 when Alice, burdened with tuberculosis and a peptic ulcer, passed away at St. Luke's Hospital at the age of 33. Funeral services were held in St. Peter's Lutheran church, officiated by Rev. Corson C. Snyder, with interment in the Memorial Park Cemetery. Pallbearers included William Wright, William C. Meyer, Sterling Altemose, John Godfrey and Warren J. Fink. Paul lived at home with his sister and widowed mother in 1949.